Banago Class Freighter: Built in 1918 by the Hillyer, Sperring, Dunn Co., Jacksonville, FL; Acquired by the Navy 1 October 1918 and commissioned the same day; Decommissioned 2 December 1918 at Boston Navy Yard and returned to the United States Shipping Board; Sold for scrap in 1922/1923. Specifications: Displacement 2,551 t.; Length 268'; Beam 45' 2"; Draft 23' 6"; Speed 10 kts. ; Complement 56; Armament one 3". 75k Probably photographed when completed. She is wearing "dazzle" type disruptive camouflage. This wooden hulled freighter, built at Jacksonville, Florida, as part of the World War I emergency fleet program. Baxley is a town in Georgia. 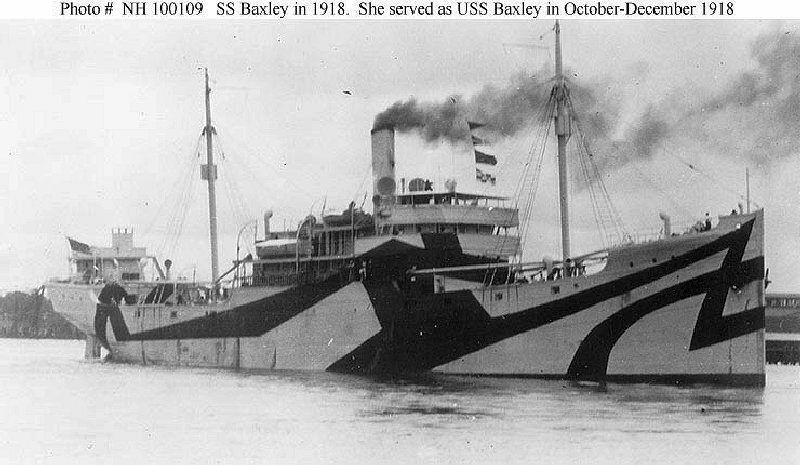 Baxley, a cargo vessel, was built in 1918 by Hillyer, Sperring, Dunn Co., Jacksonville, Fla., under a Shipping Board contract; transferred to the Navy 1 October 1918; and commissioned the same day as a Naval Overseas Transportation Service vessel, Lieutenant Commander F. R. Hunt, USNRF, in command. Baxley was fitted out to transport supplies and coal. She proceeded to Halifax, Nova Scotia, with a cargo of coal and was detained there for repairs. On 29 October 1918 she sailed for Portsmouth, N. H., and further repairs, but it was decided that she should return to Boston for demobilization. On 2 December 1918 Baxley was decommissioned at the Boston Navy Yard and returned to the Shipping Board. © 2005 Joseph M. Radigan © 1996 - 20053 NavSource Naval History. All Rights Reserved.